Walter Fall 2012 features masculine looks with a modern edge, adding lace, signature prints and soft chunky knits for a feminine touch. 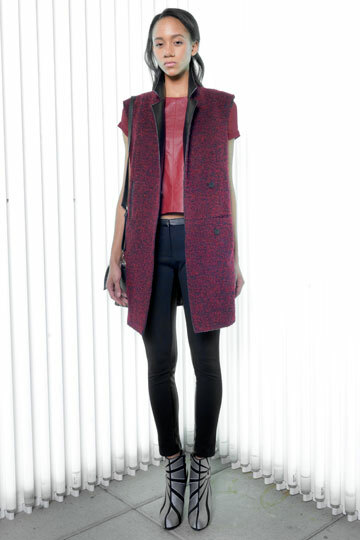 A focus on outerwear is seen through leather, tweed and jacquard fabrics. Colors transition from blush to rich deeper tones. 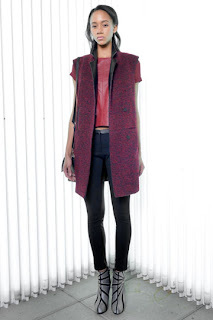 Standout pieces include a purple leather cowl neck top, heather blazer with leather trim and printed dress with leather waistband, grey and black puffer trench, grey shift dress in tweed and jacquard combo, red leather chiffon top, black ponte pant with leather insets and black leather leggings.